My husband and I are incurable travelers and we also love where we live so don't see ourselves becoming full time RVers but after years of travel through Canada, The US and Mexico in a VW Sybchro, living and travelling on a sailboat and wandering around Asia and Southeast Asia we have decided to venture out on a motor home odyssey around North America (Odysseys don't have to be uncomfortable do they?). The plan is to leave sometime in September and be gone about six months, focusing on staying in warm spots. We are looking forward to seeing new places , meeting new friends, and visiting old friends. Until then though, we welcome the opportunity to share our property with other boondockers passing through who would like to experience the beauty of Vancouver Island. 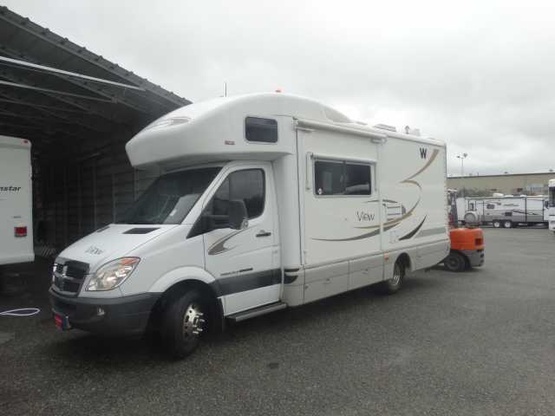 We recently purchased a 2008 Class C Winnebago View that is 24 feet long with one slide and we don't tow a car. No Funky decorations yet, we're happy to be anonymous.